Greg Pontius, a long time resident of Hawaii, was born in Seattle, and lived most of his young life in a small desert town in Eastern Washington, where he developed a love for drawing. His high school offered an extensive four year wood and metal shop program that gave him a wonderful avenue for expression. Greg started college in Spokane, where the emphasis was Commercial Arts. After a successful year he moved on to a Fine Arts Program in Everett, Washington. This was a school with no limits, allowing him to express freely in oil painting, metal, glass blowing, and what would later become his favorite, wood sculpture..
Greg painted large oils through the '70's. and having an aptitude for mechanics and a love of welding, produced abstract metal sculptures. Moving to Hawaii in January of 1977 and discovering the wealth of locally grown hardwoods, he focused his talents on wood sculptures. Greg collects his wood himself, believing it is one of the most important parts of the project. He says, "I feel like a miner looking for a gem". He is widely known for his Sea Life Sculptures, whales of all kinds, some as large as seven feet, many with a calf or in arrangements with dolphins. He also creates jewelry boxes in the form of whales, eels or honu (Hawaiian for turtle). At first they appear to be pure sculpture, then, "Surprise! ", they open up with trays and even small drawers. In the past years Greg has made hundreds of small to large, unique, one of a kind sculpture and boxes, from an almost endless variety of woods. Many of Greg's new pieces are inspired by the patron and he finds it exciting to work together to bring form to an idea. 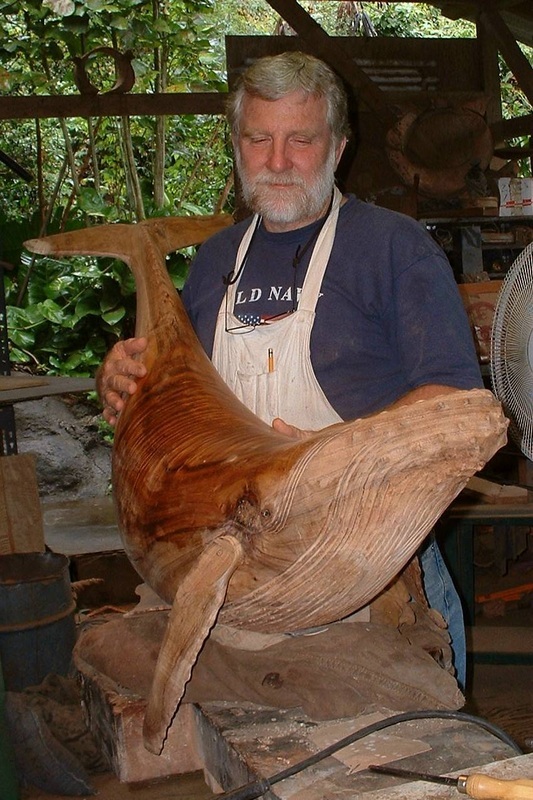 Greg is very busy carving turtles, dolphins, whales, and other sea life sculpture, along with bamboo and abstract fine art pieces. He spends much time in his studio nestled in the jungle on the northern end of the Big Island where he lives with his wife and son. Greg loves life very much and believes that only after receiving God's love in his life, was he able to find success in his work. He is often heard to say, " I can't wait to get up and go to work in the morning."